As our list of living 'admirables' gets shorter and shorter, the newly published book Sainted & Painted will restore your faith in mankind, or at least in womankind. Cindy Michaud, author and illustrator, presents a dozen new heroes (aka saints) in her charming 9" x 6" book which will delight you in many ways. Sainted & Painted, Stories of the Not Wholly Holy, introduces such modern day saints as St. Jane of the Generous, St. Sharon of the Survivors, St. Cheri of the Faeries and St. Amy of the Adventurous. The "miracles" of these real life characters are storied vignette-style and followed by original portraits painted a la Modigliani. Symbols used for each saint as well as decisions made regarding the pose are detailed along with the story. Each chapter will amuse and inspire you and may even lead you to light a few candles in tribute. Explaining the saint envy she experienced as a child, Cindy writes about the day she realized that even as a Protestant she had a saint to call upon. Anyone who was raised with saints, or wishes they had been, will be entertained and educated with this little tome. 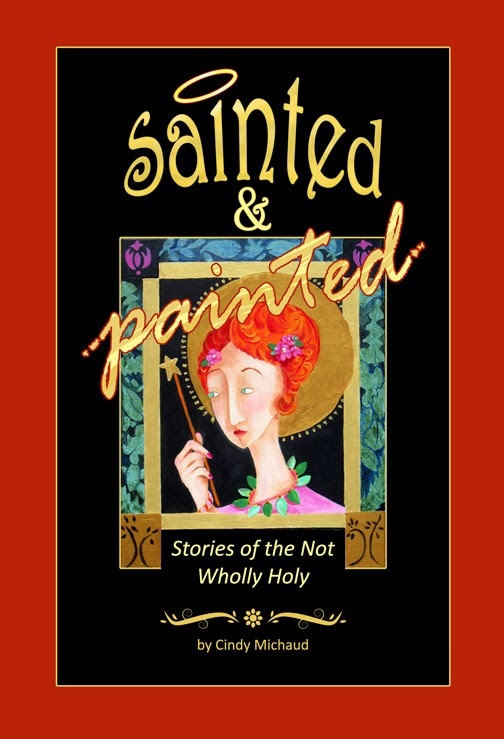 At only $12.99 the full color book makes the perfect "on hand" gift to share with girl friends, church friends, art lovers or those who may qualify for sainthood themselves. Copies are available on Amazon as well as Createspace. Cindy is an artist and sometimes-author living in Melbourne, FL and Seven Devils, NC. You may reach her at art@cindymichaud.com or visit her webpage at www.cindymichaud.com. This book follows her success with She Knew, Finally, which is still in print and available. Writers and readers who enjoy learning more about art, artists and art appreciation will enjoy her weekly blog and may subscribe at her website.